One of the big handicaps of the iPhone is the lack of a proper dedicated shutter button for the camera app. Having to press the screen to take photos is far from convenient. 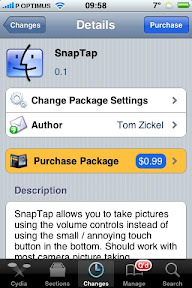 Well, if you have your iPhone jailbroken, now there's also an app for that: SnapTap transforms the volume buttons into shutter buttons once inside the camera app! Very cool and totally worth the price. Get it on Cydia Store.